Hello Tuesday and writer-friends! Time to be held accountable for our writing actions…or lack thereof. Unfortunately, I fall into that “Lack Thereof” category this week. Since practices have gone five nights out of the week, I’ve lost some daytime hours and have had to adjust to a new routine. But I have done some writing related thingy-bobs. What is this? 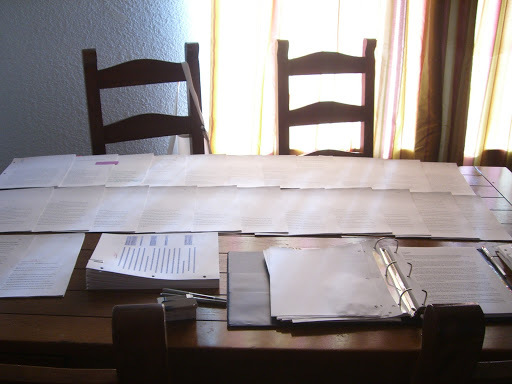 This is my dining room table, covered with chapters from my La Llorona story. (And for those who might be interested in learning more about the legend of La Llorona so you kinda know what the story touches on: here’s a good website.) I discovered that I didn’t have enough room in my office to spread out, so I took over the dining room. I needed to be able to visualize what I was trying to accomplish. My plan is basically to work top left corner to bottom right corner…though you can rest assured that the second row of papers you see there will be entirely new by the time I’m done. Another thing I ran across during my PPWC stalking was this incredibly useful checklist via DeAnna Knippling. If you’re feeling down in the dumps about writing and hitting that Hopeless Phase, she’s probably got the solution somewhere on that list. What’d you guys manage to accomplish this week? Learn anything useful that I can steal? Great photo. I went to my writing group yesterday and got feedback on my current draft even though I got a call as I was leaving the house to see if I wanted tickets to the Twins/Red Sox game. Impressive when it's all spread out like that. And a bit intimidating. Maybe you should let the kids decorate it a little. Make it more friendly-like. Like chocolate. And chips. And bacon. Crap, now I want to go to lunch.